We create presentation material and marketing graphics to sell you. Lets make your next marketing campaign a success! See our graphic design solutions. Premium quality websites built for desktop, tablets and mobile to increase your market share. Attract visitors. Convert visitors into leads. Turn leads into customers! Turn customers into promoters! Presentation materials and marketing graphics to sell your business. Successful campaigns begin here. Improved search engine rank by finding and adding your most effective keywords to your website. We fuse great design, communication technology and marketing strategies to leave a lasting impression. We're a team of visual communications experts, graphic designers, art directors and usability specialists in Northern VA with more than 22 years of experience. We design and develop marketing communications and websites that are easy to navigate, sell your strengths effectively and clearly tell your story. Make Your Website a Marketing Sucess! A must-read checklist before you redesign or build a website. Specific questions to focus on what is needed to achieve online success. For instance, a business website client would like their site to get found easily online and cause viewers to call them and purchase their products or services. 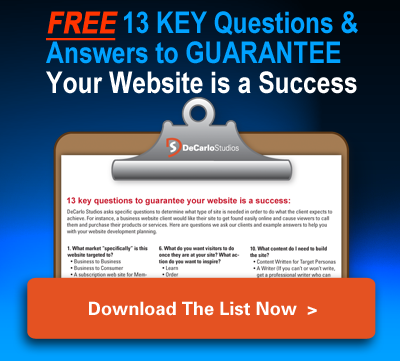 Here are questions and answers you need to position your site for success.